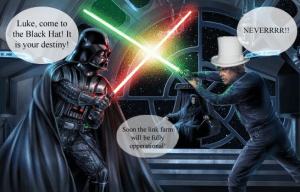 Thanks to iovacommunications.com for this – best image related to White Hat vs Black Hat i’ve seen! In the early days of the Internet, search engines realized that some websites provided more useful content compared to others. As a result, they ranked these kinds of websites higher in the search results. On the other hand, some webmasters noticed that a few tweaks with their website resulted in higher search engine rankings, whether there was useful content or not. Around that time, search engine optimisation was born. Nowadays, search engine optimisation is a big business and it is very vital for any website to get more traffic for either more exposure and/or increasing their bottom line. If you look at it in a different perspective, search engine optimisation is cat and mouse game between webmasters and search engines. Search engines continually refine and tweak their algorithms so they can provide a better experience for their users. SEO specialists responds by trying to guess the algorithm ( or rather it’s result) and use it to their advantage. Along the way, search engine optimisation gave birth to two categories – Black Hat SEO and White Hat SEO. If you are interested to know more about these subjects, then you have come to the right place. The rest of the article is going to discuss the difference between Black Hat SEO and White Hat SEO and how each can help or damage your online marketing efforts. Exactly defining White Hat SEO can be tricky at times, as the lines between Black Hat SEO and White Hat SEO often blur depending on the method being used. To generalise, White Hat SEO are strategies and techniques that play by the search engine’s rules and guidelines. There are different kinds of White Hat techniques that are being used today such as a press release, article marketing and video marketing. When it comes to Black Hat SEO, SEO specialists typically perform strategies and methods that are against the rules/guidelines of the search engines. Most of the time, Black Hat SEO involves spamming and automation activities. The most common techniques for Black Hat SEO strategies and methods involve using link purchase, blog commenting, profile making and bookmarking. If you proceed to perform Black Hat SEO and a search engine catches you doing it, then there are two possible outcomes. One, they will penalize your site and it drops position in the search engine results. Two, on severe cases, they will ban your website from showing up in their index at all (search engine results). As mentioned before, the lines between Black Hat SEO and White Hat SEO can get blurry at times. The thing is, there are certain methods that can be used as White Hat or Black Hat SEO. For example, if you visit a blog, read it, proceed to comment with the intent of contributing to the content and leaving a backlink to your website, then you are doing white hat SEO. However, if you visit multiple blog sites and you simply paste comments over and over again (in the hopes of increasing time efficiency), or use automation tools to do thousands for you at once, then what you are doing is spamming and that can be under the realm of the Black Hat SEO. To avoid the confusion, as a general rule, if you are using methods that are not against search engine rules, then you are most likely doing a white hat SEO. Most SEO specialists will tell you that you’re better off sticking to White Hat SEO. However, this article will suggest that you make use of both hats, but just make sure you know what you’re doing. Keep in mind, you’re not doing something illegal when using black hat methods, you are simply doing things that search engines do not like. A lot of people call this Grey Hat SEO (yes, another coloured hat!). Grey hat is basically a mixture of both, as using automation can be fine and vastly improve your efficiency, but at the same time you want to avoid being spammy, or doing too much too fast! You could compare it to a boxer. If you only use White Hat, then you are boxing with one arm. If you use Black Hat, you are using two arms but taking illegal drugs, and if caught would be disqualified. A careful mix of both (not illegal drugs but vitamins, and using both arms!) and it doesn’t take a genius to realize that you are giving yourself the best chance of victory! Great caution is needed if you are thinking of using the black hat methods, as the search engines can severely punish your website if you get caught. However, if you are knowledgeable about using grey hat methods and you know how to cover your footprints, then you will most likely outrank websites that are doing pure White Hat SEO. Furthermore, the proper hat to use depends on the goal of your website. If you are making a site that you want to rank quickly with no long-term prospect, then Black Hat methods are advisable. However, if you’re planning to build a website for the long haul, then White SEO should be your primary hat to wear. Nowadays, people can go on for hours debating which one is better, but hopefully, after reading this article you will learn a few insights about Black Hat SEO and White What; and when to use one and when to avoid one. White hat techniques works but it will take some days. Many don’t understand that and they use blackhat and ruin their site/blog. i am confusing many big seo companies are still using black hat software and techniques, is it safe for those clients who wants quick results? It depends James! Some techniques are more dangerous than others. Whatever you do though, you want to ensure a site won’t get penalised, so even if something is working now but isn’t ‘what looks normal’, it could be dangerous for the future. If a client does want quick results and black hat can sometimes offer that, just ensure any client fully understands and accepts (and documents!) the risks involved! Awesome Post! I really wanted to know about black hat SEO vs white hat SEO…and I’ve found this.Amazing! We are CheshireSEO.org - Digital Marketing & Search Engine Optimisation specialists working in the Cheshire area. We can help your business grow using a range of techniques such as SEO, social media and link building. So what have you got to lose? Get in touch today!